If there's one main thing I fear when fishing near overgrown brush, it is ticks. I've only had a couple stuck to me but that was enough to make me hate them. Recently I found one more reason to hate ticks. Not only can you get Lyme Disease you can also become allergic to meat. You read that right, a bite can stop you from eating burgers, steak and other meats that make life worth living. 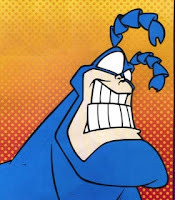 "Now, the government has not yet issued health warnings about meat allergies associated with these ticks — such allergies are still quite rare, and like many other food allergies, the presence of the antibody doesn't necessarily guarantee an allergic response. Scientists say the allergy-inducing tick bites have affected about 1,500 people since it was first reported in 2008 —compared to the roughly 25,000 new cases of Lyme diseases reported every year." I've thought about eating better but I don't want to go to this extent. Recently the blogger The Impractical Fisherman posted some info on how to prevent tick bites. I'd suggest reading it. You don't want to become an involuntary vegetarian. What is this Ad supposed to mean exactly? 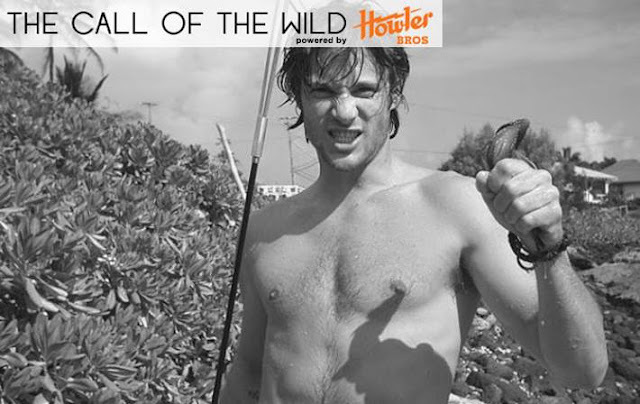 Be a man and squeeze the crap out of a fish? Ok not really a hired gun but I like to think of it that way. A guy who owns a farm offered a unique fishing opportunity. He has a small pond and feels it is over run with small bass. He wanted all of the bass and other fish removed except for bluegills. You don't get opportunities like this very often but I was concerned about the outcome of the fish being taken out. Later I was told they would be used for a fish fry. 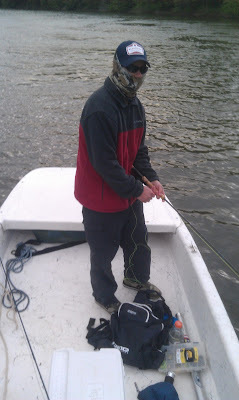 The challenge would be targeting specific fish and seeing how many I could catch in a short amount of time. I'd only have a couple hours to fish and each fish had to be measured and weighed. I started with my go to bass fly the stealth bomber. The bass in this pond average under 12inches so I went with a size 6 fly. With my first cast I had a small 4inch bass inspect the fly. I figured it would slam it but it came up sniffed the fly then refused. The next 20min were spent figuring the place out. There were so many good looking fishy spots but I couldn't see any activity. I saw swirls and breaks in the surface here and there. Then as I started to really look I could make out fish here and there. As the sun went behind the trees the fish activity picked up. The bomber was actually getting attention. These fish wanted a swimming retrieve instead of quick twitches. If I skid the fly along the surface I would get a hit. Once I caught my first fish I almost instantly released it. I had to remind myself why I was there and what I was doing. 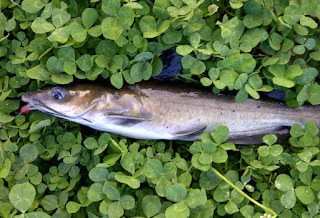 I had found an overhanging bush near the bank where fish were stacked up. Most likely feeding on dragon flies and nymphs. I caught several fish from this spot. A gill hit my popper as soon as it landed then on the way in the gill spit the fly. Right as the bomber landed a bass inhaled it. I'm not sure if the bass was following the gill or if the fly just landed right in front of the fish. It happened so fast I almost didn't react. I think I set the hook more because I was startled. The fish hit a couple feet from shore. When it was all said and done I had 7 bass and 4 bluegills in 2hrs. That wasn't very good in my opinion. Then I thought about having never fished this water and not knowing what to expect. It was a good day and a fun experience. I'm not sure if I will go back. I forgot what happens for fish when they are left in a bucket. The coloring of the bass became mottled and they looked sickly. It bothered me and as fun as it was I wondered if I did the right thing. I should have stuck a knife in their head or bashed them with a rock. That seems so gruesome but it was probably the more humane thing to do. I might be back to this pond when the fish are bigger and the owner wants them all released. Recently I bought a buff and I went with the Predator pattern. Mainly because I felt the colors would be the most natural. I'm happy with the coloring. Up close you can see the animals on the buff but from a distance it looks almost like camouflage. The first time I tried it was on the redfish trip. I had a lot of stubble and I found the buff a little irritating. You have to keep messing around with the fit or your sunglasses will fog up constantly. Even with the warm weather I didn't find the buff really hot. I paid for not wearing it enough. My lips got severely burned. The picture above was from a striper trip. The weather was unseasonably cold and there was a constant breeze. The buff provided relief and kept me warm. I think this is the best use for the buff. I wore a different style hat this time and the buff seemed to fit better with a ball cap. I found it easy to fit most of it over my face with out fogging up my sunglasses. I'll be quick with the rest of the review. I was going to write looks kind of goofy but on the river I saw more people wearing them than I ever have. After my epic redfish adventure I was put back in my place with a thorough skunking on the Roanoke River. If muskie are the fish of 10,000 casts then striped bass are the fish of at least 1,000. A buddy and I fished the whole day with out so much as a bump. I needed a pick me up. 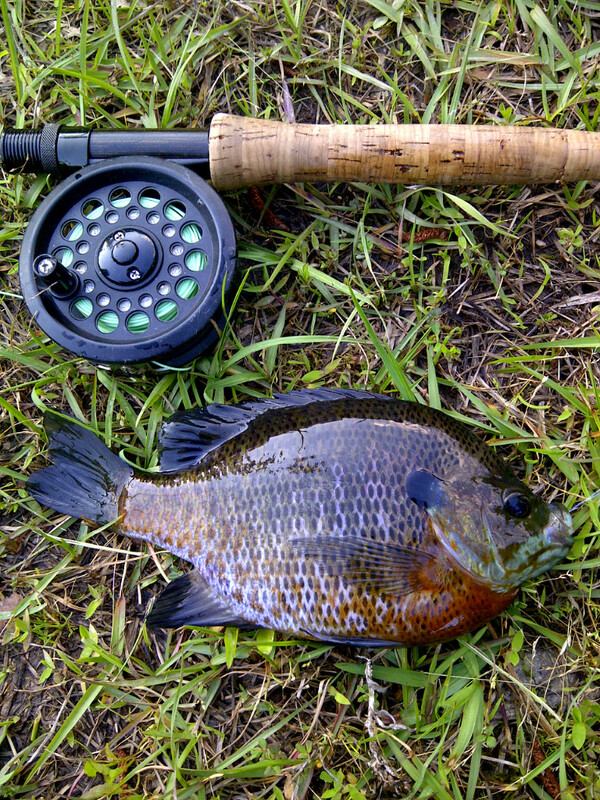 Nothing is more of a sure thing than fly fishing for gills. Especially in May. This spring has been so strange I never know what to expect anymore. At my favorite honey hole the fish weren't in their usual places. There seemed to be bass where the brim usually are. I'm not sure if the bass are chasing the gills out of their beds or what. It took awhile but eventually I found a nice swarm of chunky gills. There is a lake I have been fishing quite a bit this spring. This lake is supposedly loaded with PCB's. There are fish advisories all over stating you shouldn't eat any fish caught from the lake. The water is always dingy looking and doesn't have the best shore access for fishing. All of these things combined make a body of water that is absolutely phenomenal. The fish activity at this lake is some of the craziest I have ever seen. There seems to be more fish per square foot than I've ever experienced. The catfish are especially aggressive and always eager to take a fly. My daughter's friend kept talking about fishing and her dad asked if I could take them. I felt there weren't many better places than this crazy lake. It didn't take long and they had a fish on. 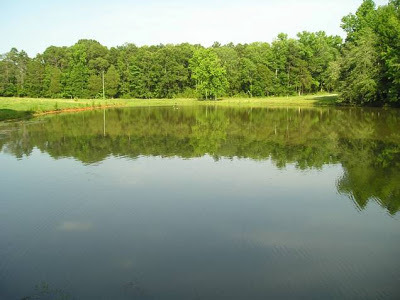 The great thing about this lake is you can catch different species of fish with out using bait. The kids had a blast. 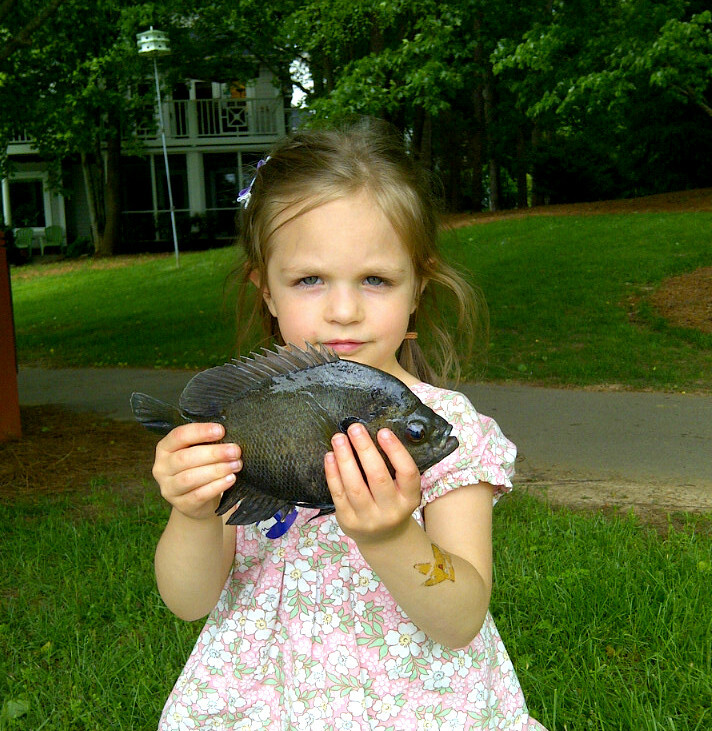 My daughter continues to impress me with her fishing skills. She still struggles with casting, but other than that, she can do everything else. I love how she isn't afraid to touch the fish. This next lake is really what I wanted to post about. I have seen more weird things here than any other place I've fished. Yesterday topped them all. 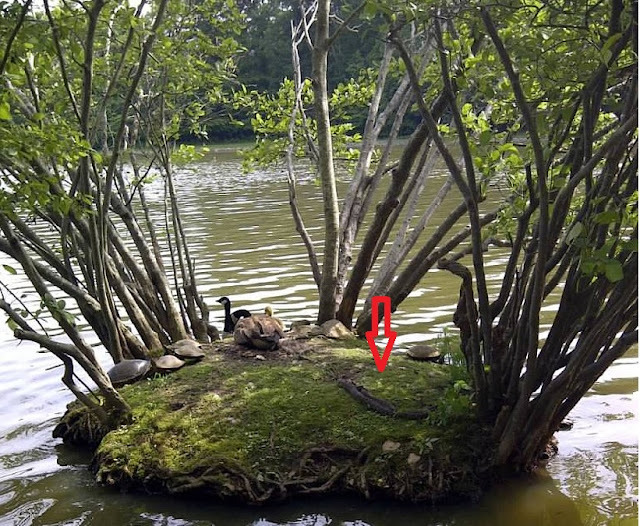 My daughter and I were walking around the lake when we spotted something weird on a small island. This island always has turtles on it but there was something else twitching near the edge and it looked strange. The island is only about 6ft from shore so you can see everything on it pretty well. 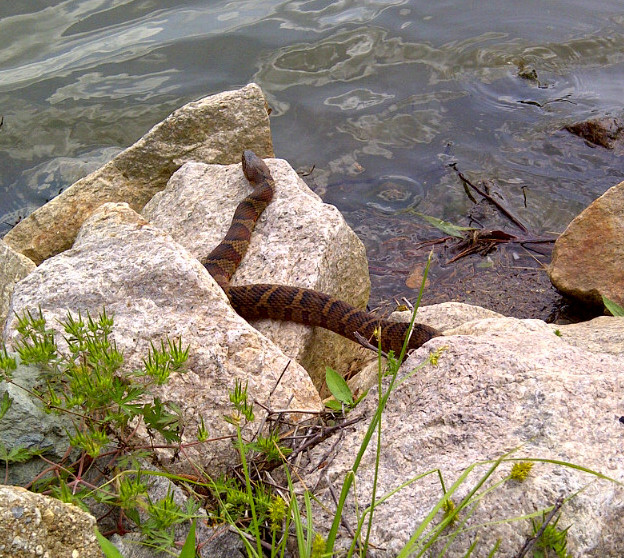 As I got closer I told my daughter it was a snake. It was too large though to be a snake. Then I tried to make out the head. There were two. It was two snakes. One of the heads kept twitching, I figured the snakes were mating or one was eating the other. Then while trying to figure out just what exactly they were doing another head appeared. Then my daughter said there are 4! Sure enough she was right. I had to take a picture of this and I'm a little disappointed that I didn't have a camera with a good zoom. You can still basically make out the animals on the island. I've pointed out the snakes. These were banded water snakes. They are all over this lake. My daughter actually almost tried picking up another one in the rocks. I have actually seen these snakes do some goofy things. I hope to get some video evidence of this behavior this summer. My daughter and I moved on to fish various spots on the lake. I didn't realize how difficult it was going to be having her fish with a fly rod. She can't seem to get the hang of it. She's so small she has a hard time stripping line and looking where the rod is pointing at the same time. So far she hasn't gotten discouraged. Mostly because after I hook a fish I hand her the rod. This one gill was a doozy. Even though she only listens about 10% of the time, scares me to death by digging in between rip rap and silently walking up behind me while I'm casting I absolutely LOVE fishing with her. 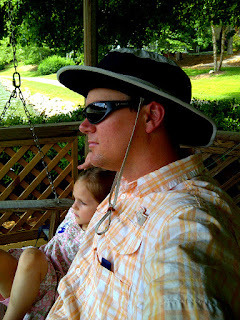 I have always dreamed about fishing with my kids. I'm blessed that I can actually do it. My fondest times are when we put the fishing aside and just enjoy the day. 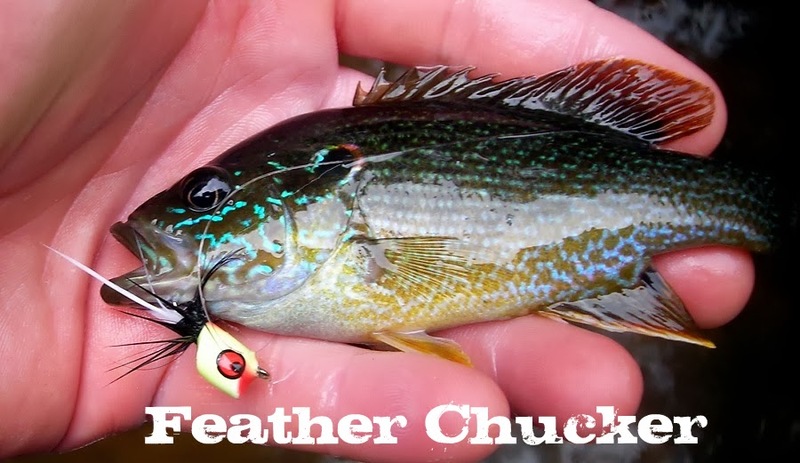 Here's something to try when the fishing is slow. 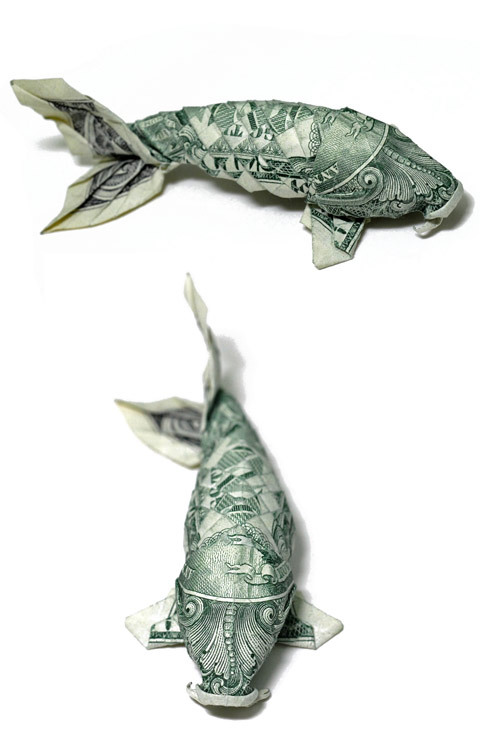 Labels: dollar folded into Carp, Origami Carp, when the fishing is slow. Well I can't say I haven't tried. I have been fishing for shad on the Neuse the last 3yrs. I have caught Hickory Shad on the Roanoke River in Weldon, NC but never anything on the Neuse. What I have really been looking for is an American Shad. 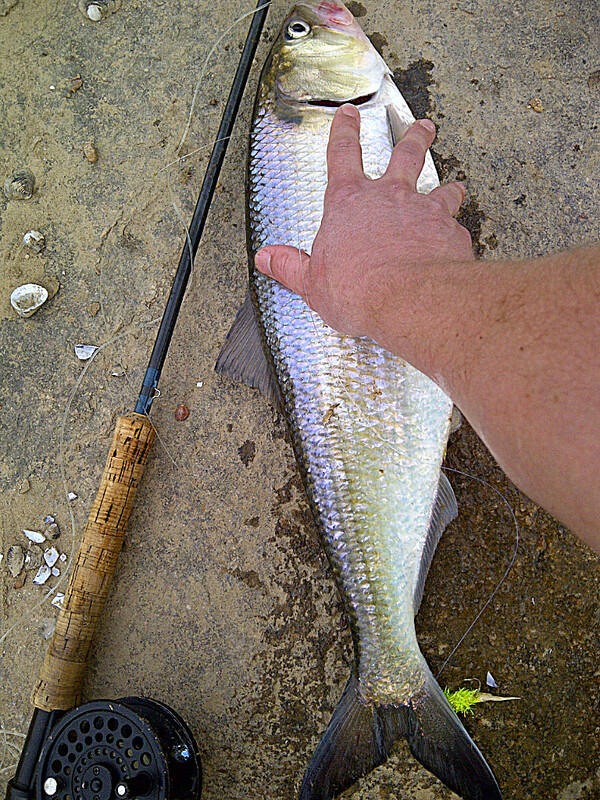 The Americans are larger than Hickory Shad growing over 5lbs. This year was the first time I really focused on it. I'm at a disadvantage because I don't have a boat. These shad can be caught from land if you know where to look. I contacted our state biologist who studies androminous fish. He gave me info on where fish were being shocked. My first three attempts were shadless. It was really strange I'd catch one fish like a crappie or bass then nothing else. I gave it a break for a couple weeks. 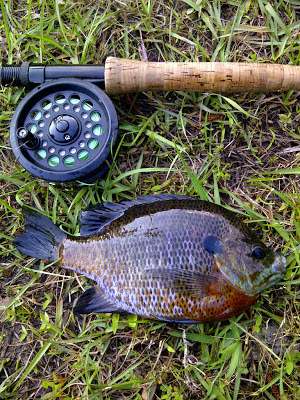 Then the reports started rolling in from my friends that spinfish. "The shad are here!" They exclaimed. 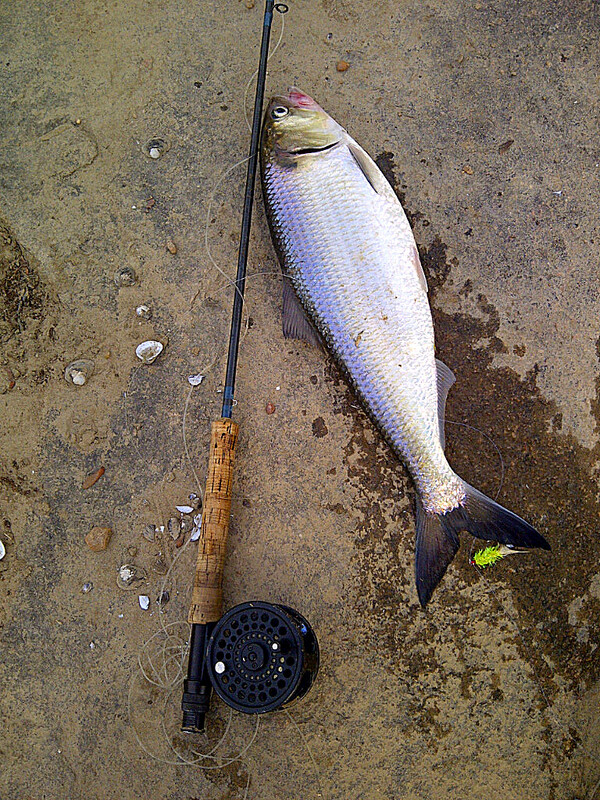 Shad are amazing creatures to me. I doubt when many people catch them they appreciate the journey these fish make. I got to the river and geared up. I went with an intermediate line and two flies I tied. The flies were really for crappie but I figured they should work for shad to. I spent the first 20 minutes casting and just trying to enjoy the river. Splashes from fish were here and there. Most likely gizzard shad. Then I felt a tap.... tap... tap.... BAM! A fish was definitely on and it was a good one. I put pressure on the fish and it seemed like it did a 180 and swam right towards me. The rod went limp and there was no tension on the line. Was it a shad? I hadn't caught one from land before so I had nothing to reference. It was a good fish whatever it was. I had wondered if that was going to be my only chance. I played around with different retrieves. Slow strips, 2-3inch quick strips, fast short strips.. FISH ON! Not the best picture. At least I got one though. It was surreal. Did I really do it? Was this really a shad? A fish that spends the majority of its life in the ocean was right here under my hand 150miles from saltwater. Pretty Cool! To top it off it was caught with a fly I tied and the fish qualifies for a North Carlina Citation. All I can think about is catching another one now. I think I have what some people call a shaddiction.